Obama may well win re-election — for that, he only has to convince voters that he’s the lesser of two evils — but the enthusiasm of his 2008 campaign has certainly vanished. There was only one problem. Obama wasn’t charismatic. He was glamorous — powerfully, persuasively, seductively so. His glamour worked as well on Bennis and Zelleke as it did on voters. 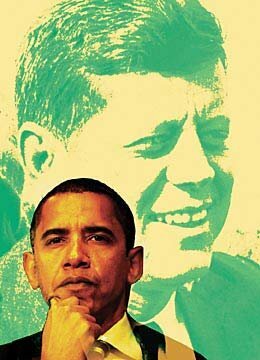 Like John Kennedy in 1960, Obama combined youth, vigor and good looks with a vague promise of political change. Like Kennedy, Obama was both charming and self-contained. Kennedy’s wealth set him apart, but Obama’s mystery stemmed from his exotic background — an upbringing and ethnicity that defied conventional categories and distanced him from humdrum American life. Obama was glamorous because he was different, and his differences mirrored his audience’s aspirations for the country. Equally glamorous was candidate Obama’s call to “a broad majority of Americans — Democrats, Republicans and independents of goodwill — who are re-engaged in the project of national renewal.” It was an invitation to the audience to entertain their own fantasies of what national renewal would look like. All voters had to do was slip on the right president. Glamour is a beautiful illusion — the word “glamour” originally meant a literal magic spell — that makes the ideal seem effortlessly attainable. Glamour hides difficulty and distractions, creating a false and enticing sense of grace. We see the dance, not the rehearsals; the beach resort, not the luggage and jet lag. There are no bills on the kitchen counter, no freckles on the pale-skinned star, no sacrifices in the promise of change. Among the early signs of Obama’s dissipating glamour were the complaints that he didn’t emote enough over the BP oil spill — a surprising criticism of a man whom many supporters had praised for his Spock-like demeanor. But apparently not everyone saw Spock in candidate Obama. Some saw Bill Clinton. They expected the president to feel their pain. Clinton, with his obvious appetites and open eagerness to please, was never glamorous — no distance or mystery for him. But Clinton was charismatic. He inspired intense loyalty, even from supporters who disagreed with him on specific policies or disapproved of his moral transgressions. * Virginia Postrel is Bloomberg View columnist writing about commerce and culture, innovation, economics and public policy. She is the author of “The Future and Its Enemies” and “The Substance of Style,” and is writing a book on glamour.